The Cuisinart Electric Griddle & Panini Press features nonstick, removable grill plates for cooking juicy burgers and crispy grilled sandwiches. The griddler provides the ideal temperature for grilling and takes the guesswork out of cooking. It has brushed stainless steel housing which makes cleanup easy. 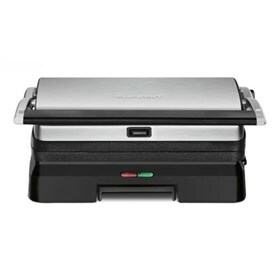 The Griddler Grill & Panini Press has many exciting features for users of all types. You can extend the lifetime of your Griddler Grill & Panini Press with the purchase of a FactoryOutletStore Factory Protection Plan. See the Griddler Grill & Panini Press product video and gallery images above for more details. The Griddler Grill & Panini Press is sold as a Brand New Unopened Item.